Before learning how to draw a turtle: some fun facts before starting sketching! Some turtles can live up to 100 years! Turtles are found in all continents except Antarctica. Turtles have good eyesight and a pretty good sense of smell. In this tutorial, you will learn how to draw a cartoon turtle using only a few shapes. The most recognizable part of this animal is without a doubt his carapace (2). 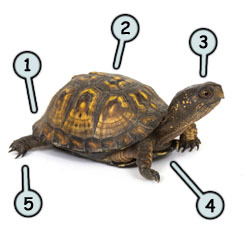 The turtle also has a small tail (1) and four flippers (5). Notice how the head (3) is similar to the one of a snake. This animal is mostly green with some yellow and brown on the shield. It's no surprise to see that the carapace is the most visible part of the turtle. The flippers are made of small circles and some rectangles while the head is represent by an oval shape. Notice how the eye is rather big compare to the head. So in order to draw some plausible cartoon turtles, you should always sketch a carapace that will make the turtle look like it's carrying a ton of bricks on its shoulder. In this example, we're gonna draw a simple turtle. First, sketch and oval shape to represent the shield. Then, draw a line to cut this shape in half and add the head using the same method. Sketch the flippers, the tail and the eyes. Complete your drawing by adding some details to the carapace. You can also add some colors to give your work a more professional look. 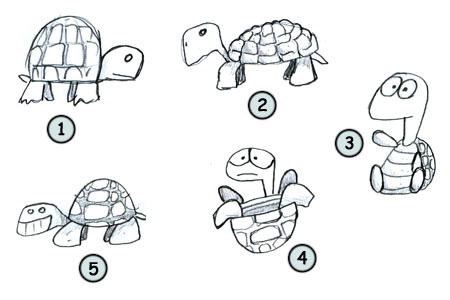 You can try to sketch different turtles and go for a more realistic design (2), a funny one (3) or a simple one (5). These animals are not so difficult to draw. Just don't forget to put emphasis on the carapace, the flippers (very important) and try to sketch the head of a snake (that should help you to draw the head of the turtle accurately). Have fun!